Protein is a nutrient deserving of focus and the most promising nutrient to help preserve lean body mass. Lack of protein can cause loss of muscle mass, decreased immunity, and weakening of the heart and respiratory system. 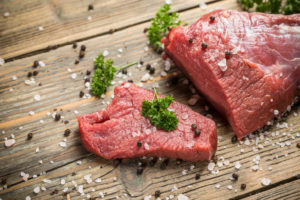 There is a growing body of evidence showing that high-protein food choices do play an essential role in health, helping to lower the risk of several diseases and premature death. So, with the importance of protein being mentioned, the reason we all go to the gym is to be healthy and to see some muscle gains, right? What if I told you that you might not be getting those gains as fast as you could!? New research suggests that the current daily protein requirements are not sufficient enough if your main goal is to increase muscle size. Research suggests that for the average male who goes to the gym and engages in resistance training 5 times a week should, on average, consume approximately 2 grams of protein per kilogram of weight. So for example, an average male weighing 80 kilograms needs approximately 160g of protein per day to give their muscles the sufficient nutrients to promote muscle growth and mass. As most of you undoubtedly know already, proteins are found in everyday food that we consume. Foods like turkey, chicken, beef, beans and nuts are all a healthy source of protein, however, if we are to meet the 2g of protein per kilogram of body weight, we will need to supplement a form of protein to meet the recommended requirement for increasing muscle mass. Choosing which form of protein and when you take and consume your protein are now major deciding factors in how much your body will actually absorb. If you were to put a cheap generic protein powder next to a well known branded bison protein, you will notice a lot more additives in the cheaper protein that may not exist in the well known brand. I recommend not being a scrooge when it comes to buying protein. Ensure you purchase and consume protein that is as close to 100% as you can and by a reputable company, this way, you know exactly what you are putting into your body. But when is the best time to take protein? It is recommended that you space out your protein intakes to around 5-6 times per day including any peri-workout intake (during/post) to maximise your results. I hope this helps you on your way to increasing muscle mass and one step closer to achieving the body you are working hard for. To achieve results faster, jump on over to www.thetransformationpro.com to sign up to my emailing list and see how you can be one step closer to your goals.